Partake in this cause by donating to the ERA Team VP Chautauqua office location or donate online! Chautauqua, NY (September 26, 2018) – ERA Team VP Real Estate and Vacation Rentals challenges local businesses to partake in the ERA Team VP Denim Days to support the American Cancer Society in the fight against breast cancer. This timely business to business challenge will take place on Friday, October 5 – during breast cancer awareness month. Denim Days invites businesses to donate $5 or more to wear jeans to work. ERA Team VP challenges local businesses to participate in Denim Days and contribute to this important fundraiser. Nationwide, Denim Days has raised over $96 million. All proceeds will go to the American Cancer Society in the fight against breast cancer. “We are aware that many of us have incorporated the casual lifestyle into our everyday attire, however we are encouraging businesses and their employees to make a simple $5 contribution on this one day of giving,” Bill Soffel, ERA Team VP Real Estate and Vacation Rentals Broker/Owner. 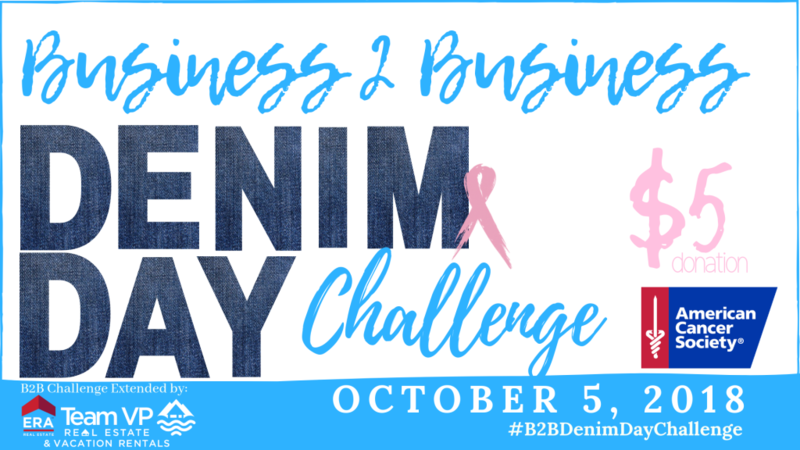 Businesses are encouraged to participate by using the hashtag #B2BDenimDayChallenge. All donations will go directly to the American Cancer Society. “We are hopeful that this campaign will not only raise a substantial amount of money for breast cancer awareness, but that it will also showcase how joining forces within our communities can result in something so much more significant,” Bill Soffel. For more information about ERA Team VP Real Estate and Vacation Rentals and the real estate/vacation rental  market in the Southern Tier of Western New York and Northwestern Pennsylvania, visit www.erateamvp.com or call  their main office at 716.413.0200. Stay up to date by responding to the Denim Day Challenge Facebook event!